When we’re teaching Spanish via Skype on www.spanishviaskype.com , our students often ask us for advice about what they should visit in Spain on their holidays. 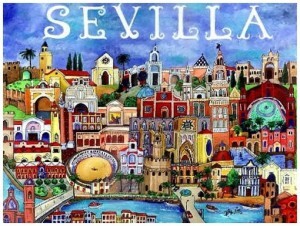 Of course, one of the first choices that comes into our mind is Sevilla. 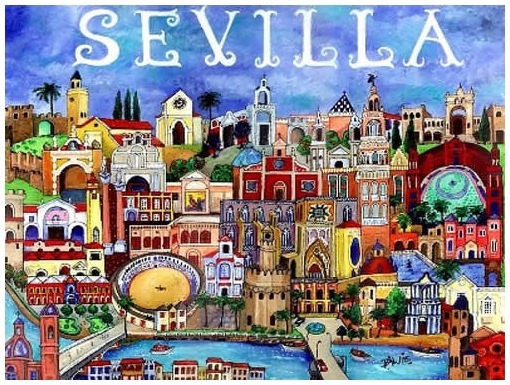 Los sevillanos (Sevillians) usually say that Sevilla tiene un color especial (Seville has a special colour) or La lluvia en Sevilla es una maravilla (rain in Seville is a wonder). With these two old sayings, they’re describing their city: Sevilla is full of brightness and happiness but it’s very hot and dry. You can visit La Giralda, La Catedral, La Torre del Oro or La Plaza de España; beautiful and inspiring places. However, in my opinion, Sevilla’s wealth is due to the Sevillians themselves. And one of their typical features is their use of Spanish. They don’t pronounce the final or the implosive S, they aspirate it: ¿Dónde estás? (¿Dónde ehtah?). They aspirate the J and GE, GI: La gente (la hente). They remove the D between vowels: No hemos comido nada (No emos comío na). They pronounce SH instead of CH: Coge el coche (Cohe el coshe). They pronounce S instead of Z, CE, CI: No tengo zapatos ni calcetines (No tengo sapatoh ni calsetineh). We hope you enjoy your visit to Sevilla and if you need extra help for your stay there, you can book a lesson of our special course “Spanish survival”. We’ll help you to find out Sevilla‘s special colour.